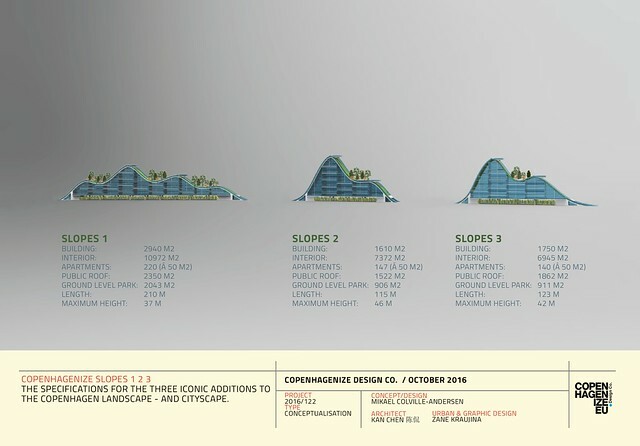 Copenhagenize Slopes 1,2,3. 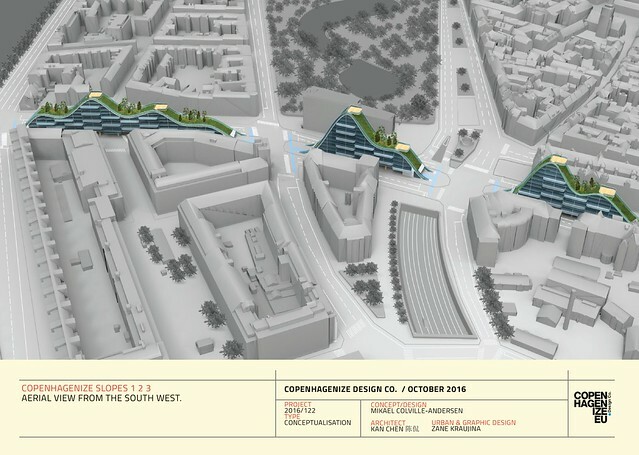 Reversing the Arrogance of Space on Hans Christian Andersen Boulevard in Copenhagen and re-demoractizing the space with 507 apartments of 50 m2, an urban park at street level, public space on 500 m of green roofs and bicycle parking for every resident and guest. For all the talk of Copenhagen being “all that” in so many urban ways, challenges and problems persist in the Danish capital. Here at Copenhagenize Design Co. we channel our impatience with lack of political will in our own city into design and ideas. Lack of bicycle parking around Copenhagen Central Station led to this solution. 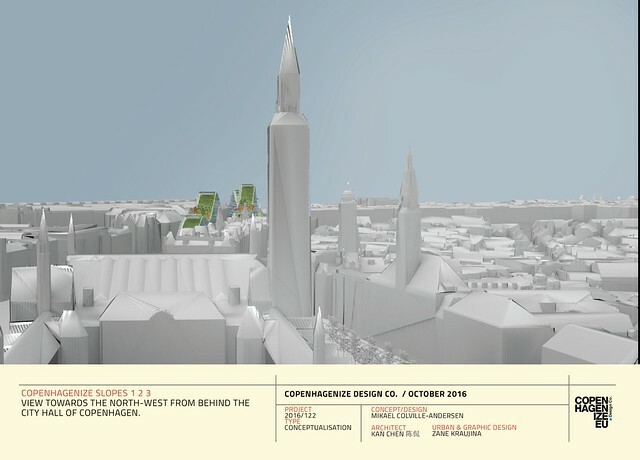 A dreadfully planned street in the Østerbro neighbourhood led to this redesign. Now we decided to tackle the biggest, smelliest elephant in the Copenhagen room. One that that has been demonstratively ignored by generations of politicians in this city. Denmark’s most famous writer, Hans Christian Andersen, would surely turn over in his grave if he knew that the nation’s most car-congested street was named after him. 60,000 cars rumbling down the canyon-like swatch of asphalt that carves the city centre in two ain’t no fairytale, sunshine. Cities with attitude need grand boulevards, it would seem. What they do with them, however, in an excellent indicator of how a city is geared towards the future of mobility. On this front, Copenhagen lags behind so many other European cities by allowing H.C. Andersens Boulevard and Åboulevarden exist in their current form. For at least a couple of decades there has been talk of putting the 60,000 cars into a tunnel underneath the existing road. Not a strange idea, considering that so many other European cities have been doing that for ages. When H.C. Andersen Boulevard crosses The Lakes, it changes name to Åboulevarden. 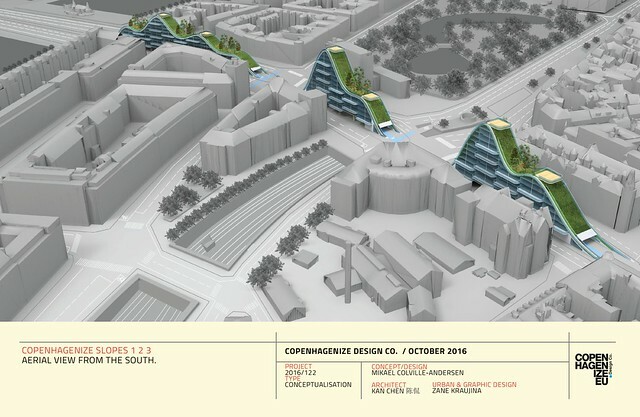 Recently, a proposed project to dig up the stream that used to run along the surface before car-centric urban planning buried the stream into a pipe beneath the cars gained purchase in the imaginations of the citizens of the city. Åboulevarden - clockwise from left: proposal for restoring the river, the river as it used to be, the current traffic each day on the road. Great stuff. We don’t, however, have faith that City Hall is going to act on this. The discussion pops up every few years and then fades away. This city is, quite simply, afraid of reducing car traffic. So here is our baseline. We need housing in Copenhagen, preferably affordable housing. We need it badly. 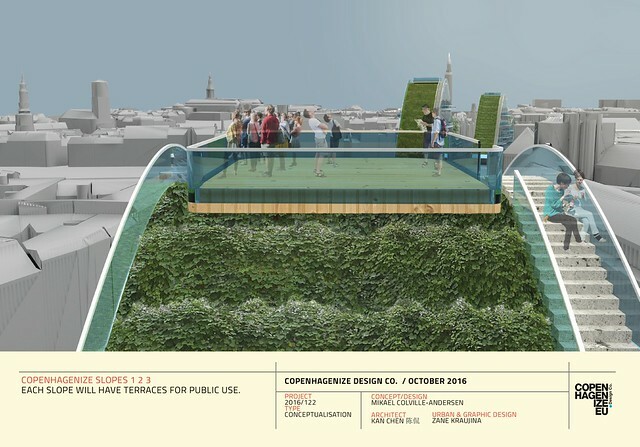 We need more green roofs for biodiversity and more public space. We have a huge swath of urban space used primarily by what Italian traffic planners called parasites. People who don’t even live in the City of Copenhagen or Frederiksberg and who certainly don’t pay taxes here. We have such high pollution on this stretch that the European Union has subpoenaed the Danish government, wanting to take them to court over their inaction on reducing pollution on this road. The current, right-wing Danish government actually wanted to move the air quality measuring station farther away from the road in order to get better results - even though we all know that a reduction in car traffic can drastically reduce pollution - as proven here. So, basically, if nobody is willing to bury the road, then let’s simply reallocate the space to more intelligent use. Let’s re-democratize it. I cycle along the boulevard every day. There are wide, safe cycle tracks to accommodate the over 25,000 daily bicycle users on the stretch, but it is bizarre to ride alongside 6-8 lanes of cars. It is Arrogance of Space ftw. For years I have envisioned a different solution and I have finally had the time to develop it. Together with Kan Chen 陈侃 from Copenhagenize Design Company. Three iconic buildings providing 507 apartments of 50 m2, three sections of green space below the structures, over 500 m of public space on the green roofs and slapping some seriously topography in the heart of the Danish capital. Aerial view from the south-west. This stretch of HC Andersen's Boulevard is rather lifeless and uninspiring from an urban planning and architectural point of view. Drab and uninviting. The Slopes will add life and dynamics and remove four car lanes - improving air quality and contributing to improving the public space. View from the south, with City Hall in the foreground. 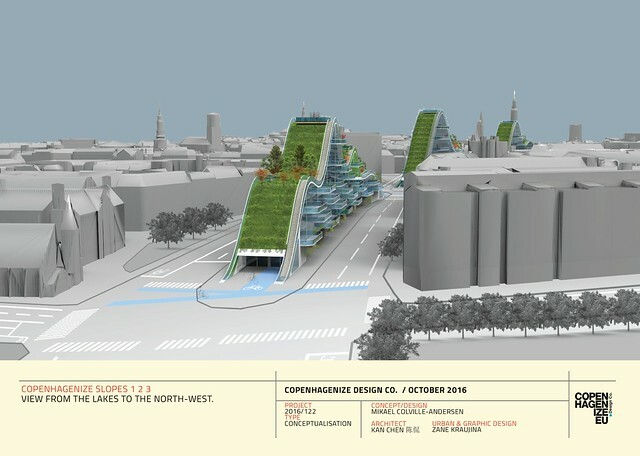 We ran the idea past an unsuspecting Copenhagen Mayor Morten Kabell, from the Technical & Environmental Dept..
Pedestrian and bike parking access at all six entry points to the three buildings. Ample bike parking - for cargo bikes, too. 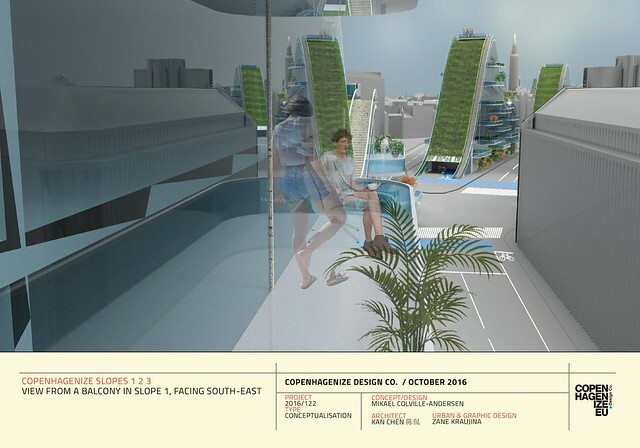 This being Copenhagen, with a car ownership rate of only 22% - and this being 2016 - the building won't have any car parking spots - much like the Bicycle House in Malmø, Sweden. 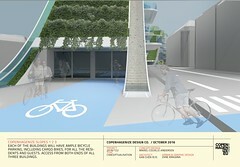 It will, however, have ample bike parking and access for all residents and guests - including cargo bikes. This is a city with 40,000 cargo bike, so that is a no-brainer. The roofs of the three buildings are designated as public space. Challenging stairs to get the thighs burning - inspired by this Dutch bridge. 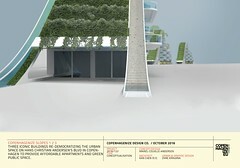 With terraces/viewing platforms at peak locations on each building. We thought that a restaurant or two could be housed on the top floor, with outdoor seating. Balconies are a must. Duh. View from the north-west, with the city centre in the background.